We normally get our monthly dose of ridership stats from Auckland Transport’s regular board meetings but with the holiday season, the next meeting isn’t till mid-February. Thankfully, AT have already updated their public facing data, which despite not as comprehensive as the board reports, it does allow us to see how we performed in December. The good news is that we performed well. Here are some highlights. Total Ridership was up 4.9% with a total of 6.12 million trips. the Rail network was up 17.6% to 1.35 million. On a 12-month rolling basis, Auckland passed 18 million trips in December only four months after hitting 17 million. Ferry trips were up 4.5% to 601k trips, continuing the steady growth we’ve been seeing for some time now. 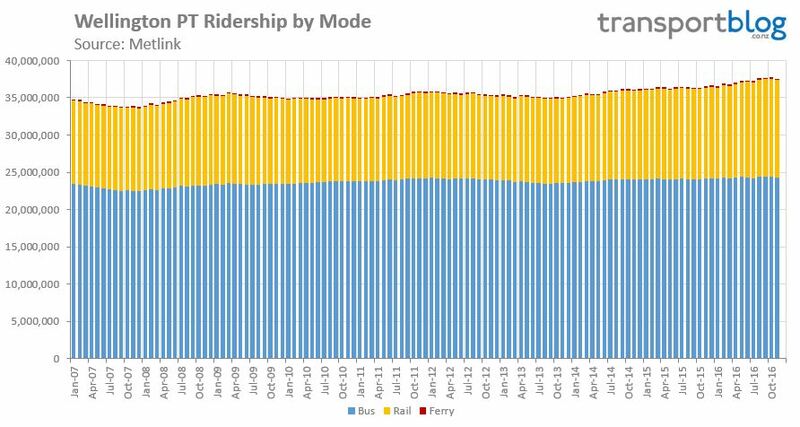 Other (non busway) buses continue to struggle, up only 0.6% to 3.84 million trips. Here are the 12-month rolling results showing the impressive growth in the RTN, particularly over the last few years. On the topic of ridership, there have long been a couple of things that bug me about the results we see on a regular basis that help to misrepresent some of the results. So I set out to see if I could change that. 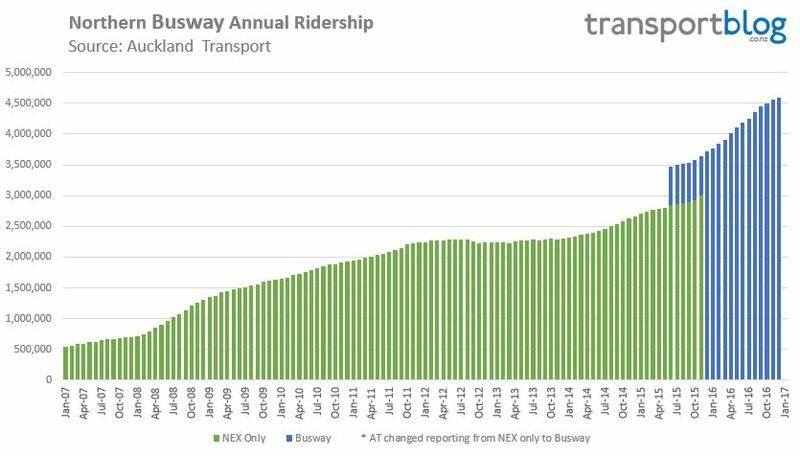 Ridership as a whole, but particularly on the RTN has been increasingly solidly for some time with a notable exception around 2011/12 and is most prominent if looking at the rail numbers which showed a roughly 10% reduction in usage. Of course the primary reason for this was the 2011 Rugby World Cup. But just how significant was the RWC or did people genuinely stop using the trains? I recalled seeing some numbers in old patronage reports estimating the impact of the RWC on a monthly basis so I went back and got those results and adjusted the graph accordingly. 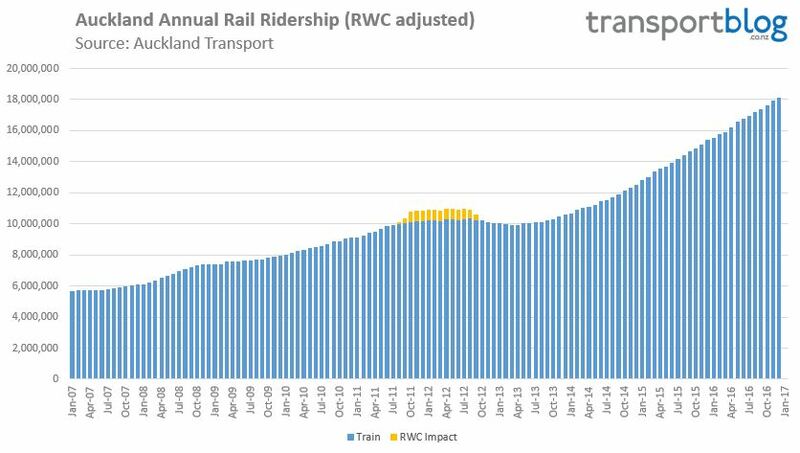 Here’s what the rail graph looks like once that RWC ridership is taken into account. Now as you can see, adjusted for the RWC numbers it becomes there was more a case of the rail network not growing anymore rather than fewer people using it. But you can also see that there’s still a little dip in the results. That’s because right as the impact of the RWC was wore off (both October 2012), AT introduced HOP to the rail network which changed how tickets were counted. Trips using the old paper tickets were counted when the ticket was bought so people could buy a 10-trip ticket and it would be counted immediately in AT’s numbers but the owner of the ticket could still be using it months later. Of course, AT gave people time to use up their old paper tickets. By comparison, HOP trips are counted when they occur. Taking this impact into account is much more difficult than the RWC but if we were able to, I’d suggest it would all but remove that remaining dip leaving a relatively flat line through to mid-2013 when numbers definitely started rising again. Last year AT changed how they counted the busway. Prior to that point they only counted ridership on the Northern Express even though many people caught buses like the 881 all the way along the busway or local buses used the busway for a small part of their journey. AT’s change was to also include trips from other services that used the busway, assuming they boarded or alighted at a busway station. The issue is that if you just look at the current information, it appears there was very rapid growth from about mid-2015 – although that doesn’t change the fact during the last year we’ve seen 20%+ growth at times. So going back over some old AT reports I was able to find the differences and separate out some of the differences between the two metrics. The result is below and shows a difference of about 500k trips annually. Now, neither of these results mean a lot in the overall given the stellar rise of PT in Auckland since the times mentioned but I found them interesting none the less so thought I’d share them. What do you think of them? I’m also interested in your thoughts about what is usually the busiest time of the year that is coming up soon and culminating in March Madness. My anecdotal observations have been that despite schools still being out and roads relatively empty, that PT is already feeling noticeably busier than last year, suggesting we have a huge March coming up. We also haven’t covered the numbers from Wellington recently so here’s a quick update to the end of November. The bus numbers remain relatively flat with only very small growth in bus use on a 12-month rolling basis. Wellington has been doing better with rail ridership recently with the 12-month rolling result up just over 7% compared to the year before to 13.1 million. The rail network is still picking up additional trips at the rate of 1 million every four months! If this continues it should break 20 million later this year… perhaps we should, or even better; AT should, run a ‘guess the date’ competition…? This is, as is the NB performance, very impressive. Will it continue? We’ve been expecting the percentage increase to ease, and it has, but because the base keeps getting bigger the growth in raw numbers has stayed remarkably consistent. I wonder if the changes to the bus network will push rail growth up in 2017. I guess the new central network will not significantly increase train ridership but flow on effects from the southern network and changes to the western network should increase ridership. Plus I am hoping that the new timetable in March will add more services and speed up journey times ( am I foolishly optimistic?). I am guessing that March and April will be extremely busy, therefore as a wild guess we will pass 20 million in early July 2017. Any word about the completion of the Manukau bus station? 1. Off-peak traffic congestion is and is a growing issue, especially on the southern motorway, parallel to the Southern Line of course. 2. Growing the utility of off-peak train use actually supports peak use; if people know they can rely on the service at other times, e.g. later at night, then there is more chance they will take a peak service to work in the morning. There needs to be a shift to all day and all week service quality on the RTN. Peaks need support. This requires opex investment however, so I would like to see the AT Board making a case to the Minister to extend the period for meeting the farebox hurdle. As it looks clear that this strong growth in ridership provides the route to meeting that target over time. The dwell time issue too is becoming more pressing too, as sorting that is the one thing that can supply more capacity at the peaks. 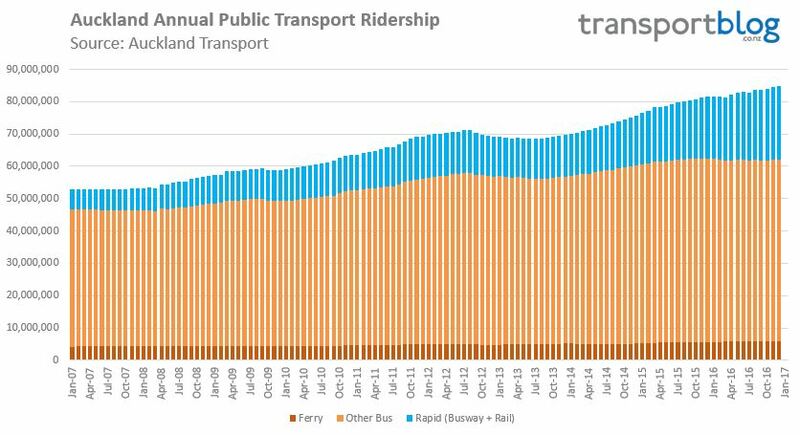 I remember a few years ago the great anticipation on this blog of when (if) we would surpass wellington’s ridership. How quaint that seems now. Auckland 11.1 rail trips per capita vs 26.2 in Wellington, 52 public transport trips per capita in Auckland vs 74 in Wellington. I wonder how rapidly that gap is actually closing? Auckland is certainly the only city in New Zealand making any significant investment to increase ridership. I wonder which has the largest volume per km of lines, my guess would be Auckland, but I suspect it is reasonably close. Auckland’s network is 120km (100km electric, 20km diesel) while Wellington’s network is 159km (101km electric, 58km diesel). Quite a lot of progress in Auckland, as opposed to the absolute lack of progress in Wellington. All this rail patronage increase but still no increase in inter-peak (still mostly 20), evening (still mostly 30) and weekend frequency (still mostly 30). Also no improvement in operating hours. Yes, very lousy service off peak, evenings, and weekends. Still so much room for service improvements. Agreed, and it’s not just rail – bus and ferry users are struggling with 30 minute waits between services all over Auckland. Too many people within the urban boundary still have no nearby access to frequent services and until we change this we are heading down the road to high carbon emissions and too many traffic fatalities. Totally agree – the weekend and evening service is appalling. During the recent holidays, there was more frequent services during the day than AT run during the weekends the remainder of the year. It really is time that more was done to have trains running more frequently in these off peak times. This highlights a failing of AT and the council in general – They’ve not managed to convey to the greater public the hard facts in an engaging manner. The person I quoted is an ex-bicycle mech (and designer), comes from the UK and has traveled quite a bit (particularly cities in which the train is king). He also owns commercial premises in the CBD and sees buses pass all day yet wonders why the double-deckers are a good idea… This guy isn’t stupid by any means, however he _is_ the kind to drive everywhere… This is the kind of person whom AT needs to engage with and target. Do we need to bother with convincing these people? Clearly with sustained double didgit growth on the rapid transit network the people who need convincing are already convinced. The proof of the pudding is in the eating, and Aucklanders are gobbling it up! – But: for anything outside walking distance, driving is much faster and more convenient than public transport. I expected that in the suburbs, but coming to that conclusion in the middle of the city was pretty weird. Usually it was clear from looking at the route planner that getting to the destination with PT would take ages. Sometimes it looked sane, but then there’s those pesky practical issues, like 30 minute frequencies, and waits to “catch up with schedule”. That included places like Mount Albert and Sylvia Park, which are right next to a station. It took ages to get even a few km away. Evidently there’s a small, but growing group of people for whom getting around using PT is working. The rest, I don’t think they need “convincing”. They just don’t have access (yet) to viable PT options. I find that neither driving nor PT can compete with the bike for intermediate distances in the city, especially once you take parking into consideration. I go to the city almost daily, when in AKL, form Grey Lynn, and the Bike is by far the quickest and most convenient. That’s true. But how do you feel about cycling along Cook Street or Hobson Street? Both are terrible; in fact just yesterday I rode up the footpath on Hobson. Exactly. I think for most people it would be something in the lines of “No way, are you crazy?”. It’s very obviously something you’re not supposed to do over there. Cycling is really convenient for those short trips, but not in Auckland. Even the more mundane things like parallel parking will provoke plenty of aggression over there. It would interesting to see how this growth is occuring over weekdays and weekends, is it the morning peak seeing the most growth (along with corresponding evening going home peak) or are the inter-peak services filling out. Perhaps just a similar % across all times of day? The evening peak seems to be more spread out, the only time the trains are at peak capacity is for an hour to an hour and a half during the AM peak. There doesn’t appear to be any growth (AT numbers only record hop cards swiped and tickets purchased) in the day time interpeak or off peak evenings and weekends. It doesn’t appear the 99 cents kids weekends have made any difference to weekend ridership. Based on the data provided, how do you reach your conclusions about inter-peak and off-peak patronage, or the uptake of the 99c child fare? Or is it just observational (and therefore very difficult to be confident about)? From not only my personal observations but from counts I see and there are from others that post regularly here also mention their observations that allow that conclusion to be drawn. It would be great to see some stats on ridership at different times of the day and also benchmark these so they can be measured over time. My observation is off peak patronage has been increasing noticeably in the evenings, a little bit during weekdays, I hardly ever travel on the weekends so not sure, but it’s just observation. Frequencies of Trains need to increase. It should be 5am – 8pm every 10 minutes in the South East and Western Line. All other time (including weekends) should be every 15/20 minutes. Last Train Sunday-Wednesday should be around 12am not the current 10pm. While Thursday – Saturday should be around 2-3am. AT needs to work timetables to suite its customers rather than the customers workings round whatever AT say. I’ve no idea if AT are planning time table increases as you suggest, with the possibility of increases in March, but staffing needs to increase quite a bit to do so. There is quite a lead in time especially driver training, around 6 months or more, and that it is probably borderline as to whether that is too short a time at the moment anyway. And then there is network capacity. Again those dwell times are a problem as they delay the movement up and down all lines by nearly a minute per platform. Furthermore I imagine Kiwirail do want access to their lines too for freight which is already tight. Next is EMU availability and servicing because if all units are in service more often then they need to come out more often and there is issues around the availability of fitters and workshop capacity. I have the feeling 57 EMU’s was the absolute bare minimum they could get away with when replacing the diesels and was not a number that projected huge growth. Nothing is insurmountable but its more complex than just adding 20 trips per day per line, job done! Maybe some thinking outside the square is called for like short runs to New Lynn and or Otahuhu with 3 car units to supplement full trip trains. There was a documented AT frequency plan for off-peak pre-CRL shown on here a while ago that had frequencies considerably higher than they currently are. I assume the number of EMUs would be based on this or more likely vice-versa. They have had plenty of lead in time to train new crew, so I can only assume it is a shortsighted OPEX decision. The cancellation of the last few drivers schools puts everything up to a year behind. Can you tell us more?.. Lack of driver apprentice applicants? Lack of teachers? Lack of funding? Lack of funding from AT along with lack of a long term contract for Transdev so them not wanting to spend their own money. Eastern Line trains seem to be running full already especially at Manukau, Panmure and into Britomart. Will take some trips out on the Southern Line next week when schools are back to see how that is going. The Western Line if this all rings out to be true is about to be dumped on by AT. There is a major issue around the leadership regarding rail. It seems to me there is no leadership or intention to improve things. Phil goff should considering firing the rail boss and replace with somebody who can move things foward. Craig Inger oversees Rail Services while another person oversees Rail development (I am assuming the infrastructure). Craig is also ex Transdev (then Veolia) as well. Is there statistics about how the southern new bus network performs? This would be good. From what I’ve seen early running is still a massive issue, despite promises that PTOM fixes this by penalizing operators. Still see buses running as much as 15 min EARLY on 309 route operated by Go Bus, not so sure about other routes. The rail graph makes it look like the Rugby World Cup resulted in a decline in base growth. Maybe investment in the RWC crowded out investment in other enterprises. The flat period correlates to the electrification works with its many disruptions, and the old diesels breaking down more often due to their age and the sensible tail-off in maintenance. That makes sense, but there is no spike in bus use for that period. Actually it shows a similar fall to rail. I wonder whether the bus is related to the phase out on monthly passes which I understand were counted differently? Probably nothing more than me falling into the post hoc ergo propter hoc fallacy. AT are shuffling rail units around and shortening run times to increase the capacity for March, capacity on the rail network is only an issue for less than an hour and a half a day during the AM peak but it is significant enough warrant changes. If I were AT, I’d look at those numbers snd start looking really hard for ways to order now that first tranche of new emus. If I were AT, I would have done that months ago. But as the proverb goes, the second best time to order new EMUs is right now. And here we have over 100 unused carriages which could be used for Huapai to Pukekohe services(bypassing Britomart). All paid for by ratepayers and taxpayers with a 30 year lifespan and AVAILABLE now. EMU’s, if ordered today from CAF will take 4 years for delivery (actually 3.7 years) according to my source at CAF. So, wait until 2021 or implement some SA/SD stock now or next year? So true Jon Reeves. The issue for the reintroduction of the SA’s is the locomotives but there are more than enough DC’s sitting around at the Hutt to be refitted. And if anyone got brave enough to electrify both sections Electric loco’s could be obtained from China for example speed things up. You could be reassured though the dwell times for those would be half that of the EMU’s. Not sure there would be anymore capacity at Newmarket for these Huapai to Pukekohe services. Time to look somewhere else with a more realistic delivery schedule. Unfortunately the GFC is well and truly over and all first world manufacturers of EMU’s have solid order books. CAF would be the first choice of AT as they already have a 15 year contract to maintain the EMU’s. So all transport spotters will have to live with the fact: SA/SD’s can be used now while we wait until a next batch of EMU’s arrives in 2021 if ordered NOW. It is the ONLY way AT will be able to cope with increasing demand for rail services over the interim period. Jon Reeves, in the days of British Rail such a cascade of surplus rolling stock to areas of need is exactly what would have happened. I suspect the reason the surplus SA/SD’s are not being considered is bound up with politics and image rather than practicality. The Silverdale Park and Ride carpark was well overflowing today. There must have been 100+ extra vehicles over and above the 206 official carparks. The new station that starts build this month will have space for 600 carparks but I’d say those will be full within 6 months of opening. Meanwhile, Auckland Transport refuse to add any local bus priority measures on the coast. Also, only NE bound buses go thorough the Silverdale town centre because Auckland Transport refuse to install traffic lights at the Silverdale Road / Hibiscus Coast Hwy intersection. This is a ludicrous situation.